Spatial thinking allows us to encode and transform information about objects and their location, and thus to find our way in the world and perform technical activities such as tool making, providing the foundation for a wide range of activities, such as the design of buildings or the solution of mathematics problems. The overarching goal of the RISC Lab is to understand spatial learning and cognition and how they can be fostered by effective technology and education. Dr. Thomas Shipley concentrates on spatial thinking in the geosciences. Dr. Nora Newcombe studies navigation, spatial memory and spatial thinking in mathematics and physics. See also the Spatial Intelligence and Learning Center (SILC) which is funded by the National Science Foundation. Our colleagues at the Olson lab have created a Youtube channel. Check out their first video here, which demonstrates what it is like to get an MRI for a research study! The RISC lab welcomes Elisabeth Boyce-Jacino (graduate of Vassar College) and Rebecca Adler (graduate of Northwestern University) as new lab managers! Six of our Spring 2018 interns presented at the Temple Undergraduate Research Forum this year: Shayna Black, Refa Haj, RJ Nair, Breanna Orlando, Julie Schilling, and Feng Xing. Great work, everyone! April 2018. Zoë Ngo received the 2018 Bersh Award for her first author paper “The Ontogeny of Relational Memory and Pattern Separation“. Congratulations, Zoe! April 2018. Drs. Alix Davatzes, Kristin Gagnier, Ilyse Resnick and Thomas Shipley discuss supporting spatial learning in geoscience in a feature article on Eos. February 2018. The RISC Lab is seeking a new Lab Coordinator! See more information here. January 2018. 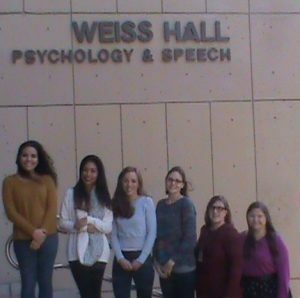 Maria Brucato and Mia Velazquez gave talks at the Penn State Thinking Within Symposium, organized in part by Dr. Nora Newcombe. December 2017.